Perfect size, amazing price! You can't go wrong with these ladles, and what a great price. We find that one ladle is the right size for a small soup cup and two ladles are just right for the soup bowls we use. They have been very durable so far. What can I say, these ladles are a great deal for the money! They are as thick as any other ladle and size is accurate. I would order these for sure! I really like this ladle. It's pretty huge, so finding a drawer for it could be tough, but you can hang it up and the extra size means it will never fall into your pot of sauce and get all messy. Nice ladle for your soups or creams. I find the material to be a little thin and I am not convinced of its durability. But considering the price, i cannot be too picky. Nice item for the price. We use these to ladle our soups into customer's containers. We purchased a bunch of these (one for each soup). I purchased several different size ladles - the 6 oz is a great size! Wonderful for watching portions on serving and it's easy to clean and easy to store. Bought these ladles to use in our restaurant. They are great for our giant pots of liquids. They fit on the wall of the pots perfectly. This one piece stainless steel ladle is perfect for our soups. I love how it has the hook at the edge so that it doesn't fall in to the pot. These one-piece stainless steel ladles are great for getting an accurate pour on soups, chilis, and other sauces. The handle makes it easy to store. Handy, accurate ladle. Good for not only serving but measuring as well. Save time and space by using this ladle instead of measuring cups. The hook is handy as well! Great product for the price, nice finish as well as easy to handle. Makes measuring easy. 10/10 would buy again or definitely recommend to someone. Perfect size to use for pouring beans onto a cup. We will order a different size for our next event. They do not rust like other stainless steel products we had purchased. we will stick to these. Durable, easy to clean, and the perfect size for home use.. Not much else to say. It does what it's intended to and is great for serving out soups and sauces. My only complaint is that I wish it was magnetic. Perfect size ladle for our crepe making business. These ladies have held up super well even with constant daily use. No scratches, bends of any kind. This 6 oz ladle is a great quality: it is durable and easy to clean. The curved handle allows us to hang it on our soup pots which is a huge plus. The quality of the ladle is great. I also love that it has a handle you can rest along side of the pot. Great product! This is a great ladle to ladle out soups. We use it at the restaurant and also use it at my house when my mom cooks. Simple ladle but great price and cheap shipping allows us to keep a few on stock for when you have multiple soups and sauces that require different sizes. I bought these soup ladies for a wedding reception and they worked great for serving from soup chafers that they were used with at reception. This is affordable, durable and does exactly what you need it to do! No more welded two-piece ladles for us -- this is most definitely what we use moving forward. This is 6 ounce ladle is about medium-size if you are comparing the other sizes sold by this company, however this is quite a generous serving size for most catering lines. We like that this is stainless steel and good-quality, and you certainly cannot beat the price for this product. 6 ounce is enough for indiviual portions of soup. I was going to use for red sauce on pasta but it is just too big. I am glad I have other uses for this as it is great quality. The 6 oz. One-Piece Stainless Steel Ladle is a highly reliable tool that will not easily bend or break. It is sturdy and the handle can easily be hung off a pot or punch bowl. I use these for everyday use. Top quality durable and cleans easily. Just the right size for all my sauces. Great bang for your buck. Purchased this ladle to serve sausage gravy over biscuits for a large crowd. It was the perfect serving size for 1/2 order of biscuits and gravy and the hook at the end made it easy to set down without it falling into the gravy. Great quality and beautiful stainless. We use these every day in the restaurant. Great, very long handle which is good for using in a full pot of soup. Would be nice if it had a little pour spout in the cup for easier pouring, but otherwise very good product. Solid piece of metal. It's very well polished so nothing sticks, and it holds up admirably, it's very sturdy. The hook is attached too which WOULD be convenient if I had anywhere to hang my kitchen things. This ladle would work well in a buffet style or soup bar situation. It's lightweight, and the long handle and hook on the end allows it rest on a soup warmer. The 6 oz is a good size for using with a regular soup bowl, but a 4 oz ladle would be more appropriate, and less messy, when serving a smaller cup of soup. I needed a good ladle for cooking events and pop-up restaurants. This restaurant quality ladle is strong enough to carry to offsite events and will not dent or lose form easily. A great little gadget that serves it's need well. Also, the best part is that it is one solid piece which means there's no rivet to inevitably fail and leave you with a worthless tool. This is a pretty big ladle. One ladle full is a perfect portion of stew or any hardy soups. These are not the sturdiest ladles you can buy, but they are plenty good for every day use. The only regret I have about this ladle is that I only purchased one. I love this ladle and will be buying more for my kitchen. Very durable and polished ladle that has not corroded from detergents. Dish washer safe and perfect size for soups and stews. Perfectly functional, of course, and I can't imagine wearing this out even over a lifetime of hard use. It is perfect to serve hot soup. I needed a ladle that would get to the bottom of my large pot without having to stick my hand in the pot. This does the trick. Also very sturdy yet lightweight. Beats the heck out of plastic. are the BEST ladles!! I love that they come in so many different sizes. They are much cheaper here than on stores and they are really great quality. I use mine for many different things! This 6oz ladle is great for stew, soups, and sauces. The one piece design is great when I've seen many other ladles in a two piece design become loose or break where connected. This is my go-to ladle when serving my soups and even my batter for pancakes. It is so easy to use and fills our bowls in two scoops. I love using the stainless steel ladle........great for soups especially. They come in handy during catering events, or family gatherings. I will definitely recommend them. This 6 ounce ladel is Sturdy and rigid. I use these almost weekly at home. There easy to hand wash so that is a plus. Thanks WEBstaurant store for the constant quality and price. These are the BEST ladles!! I love that they come in so many different sizes. They are much cheaper here than on stores and they are really great quality. I use mine for many different things! Extra easy for portioning out dry or wet foods and looks great doing it. Very easy to clean and holds up to dense consistencies. Great price and great value. Used the 6 oz. 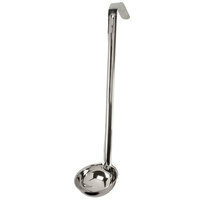 One-Piece Stainless Steel Ladle to pick up cheerios. Nice to be able to grab this ladle and get 6 oz worth of cheerios and knoiw that you are able to portion the amount that you eat. Great for your health. Really well built and heavy duty. Note that the handle is all metal, which makes it a bit uncomfortable if you were to be ladling things for hours. This is the best size for most of our uses. We use these in pasta sauces and soups. We have purchased many and will purchase more. I use this 6 ounce one piece stainless steel ladle to measure out our blinis for a smoked sea trout dish. They are super shiny and release the batter easily. Perfect size ladle to pour in an 8 oz cup with ice in it. It is light weight and easy to wash. The stainless material is shiny and pretty. Amazing price for such a quality product. Not sure why someone else's turned black, unless the heat in their steam table is too high, causing the soup to cake on it. Perfect for pouring soup bowls at 12oz. Highly recommended! This stainless steel ladle is perfect for my canning needs. I don't now how many times the regular sized ladles fell into my food in my stock pot because they were too short. No more with this ladle. Perfect for filling canning jars or serving soup and sauces. This easy to wash stainless steel ladle is perfect for soups and sauces making your job easy by taking the guess work out. Scoop 6 oz. of soup and go without having to think if you have too much or too little. A must have for soup warmers and sauces. Love this one piece ladle. The stainless steel construction makes it rust proof and easy to keep clean. On my rebuy list without a doubt. Everything I look for in a ladle I have found in this ladle. I use it for soup but it can be used for other things as well. Highly recommended! Pretty standard ladle that we use for ladling out mousse into molds. Makes the job easier and cleaner. Also easy to wash in dishwasher and still in good condition. I bought two ladles for our soup kettles we began using at the cafe portion in our bakery. They are sturdy construction and easy to clean! The best laddle I ever owned, hefty, nice and shiny, will order some more soon, I really love the long handle, comfortable use in my stock pot. These ladles are good quality and perfect for dishing out soup or chili when we cater with stations. The handle is long enough to get the goodies from the bottom of the soup chafer! We love the looks of these ladles when new and they work great for our soups....BUT after just a few weeks in use in our steam table the ladle turns black! Not happy with the appearance. We use them in all of our soups and chili. Not sure why they turn black, but assume the silver finish is altered. Thank you for your review! We're sorry the ladle you purchased did not work out. Try this Star 6 oz. ladle instead for a heavy duty stainless steel ladle that won’t tarnish. I use this ladle at home. It is not the most most "cute" looking thing, sure. And it does not have a particularly comfortable handle, no silicone grip or molded handle or what have you. But it is big and it's fine looking and it's pretty strong. I put it in the dishwasher though it's easy to wipe clean as well. Made from quality stainless steel and look very professionally. They function just as you would expect a ladle to, we use them mainly for soups and au jus. Nothing fancy about this ladle, but it gets the job done. Feels very sturdy, the ladle is hooked at the top of the handle, and the spoon volume of 6-oz is perfect for my uses at home. Plus, the fact that it's one piece means that it's less likely to fall apart compared to ones that are joined at the base of the handle. I only have one at home right now but I'm definitely going to order another. Highly recommended. These are my go to ladles for my sausage gravy and soup. There is NO way that you can find a better price somewhere for the quality that you get. I'll never buy them anywhere else unless I need them the same day. Love the fact that it is one piece, no tack welds to rot out. Plenty stiff and a great size, easy to manage/direct. Easy cleaning with no joints in the metal. These ladles fit the inset pots nicely. One ladle will fill an average sized bowl acceptably. The handle could be smoother and feel nicer in your hand, but this is not fine serving ware after all - just a plain soup ladle. Thanks for reviewing this item! This is an affordable, quality ladle that can withstand the strains that a commercial kitchen puts on it. If you are looking for a ladle better suited for an establishment with fine serving ware, check out the 6 oz Vollrath Jacob's Pride 4980620 Black Handle Ladle. It offers a mirror-finished bowl and shaft as well as a comfortable, heat resistant, plastic coated handle. These ladles are a great size for gravy if the gravy is in a large bowl or pot. The quality is great but to big for a small to medium container. This is a great ladle I use it in the soup chamfers and is so easy while serving soup to many guests. Valued reasonably well also. This is a great utensil, sturdy enough for us and we bought multiple to hang in succession. Highly recommend to those going for both look and purpose. This item works well, the handle can be bent (which i like) so that it can fit different angles around my other equipment and make food easier to get to. The 6oz ladle is a standard size ladle for commercial or home kitchen. It is not small and not big, thus it makes it easy to use it for the most of the tasks. I personally use it with broths, soups and sauces. It is made from stainless steel and is always shiny, which attracts a lot of positive attention. Since it is a one-piece ladle, then it is sturdier than the two-piece utensils, because there are no spot-welded parts. Every kitchen should have at least 1 ladle, and the 6oz ladle should be the 1st one.